It’s a question that many event planners ask as they prep for a special day. 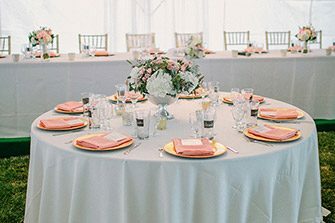 We suggest renting linens as a great way to simplify event prep. If you’ve got a menu to plan, decorations to consider, and countless other items to order, it’s a relief to have someone else handle the linens! 1. Easy Set Up / Clean Up. 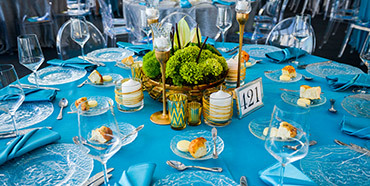 Well Dressed Tables and other rental outfits deliver linens directly to your event venue on the day-of. (You won’t have to store 80 lbs. of napkins and tablecloths in your guest bedroom / extra office leading up to the event.) You can expect your linens to show up clean and pressed, exactly when you need them. When the event is over – you don’t have to worry about the linens. We’ll provide bags for the used linens, and Well Dressed Tables will handle the dirty laundry. You don’t have to take a chance on product quality when you rent. Well Dressed Tables rents out high-quality linens that you can actually look at before you make a purchase. You’ll be able to look at our “linen book,” which has fabric samples of each piece. 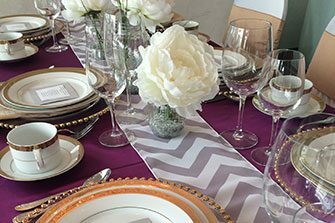 To ensure the final look meets your expectations, we’ll even set up a real table with your linens – tablecloth, chair covers, napkins, etc. 3. Any Color. Any Fabric. Same Cost! Linens don’t have to be black and white. 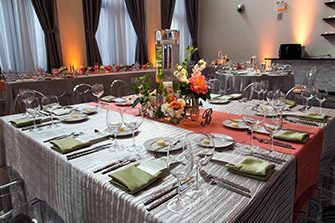 Rent a colorful or specialty linen to reflect your event’s theme or your wedding colors. Well Dressed Tables charges by the size of a linen, not by color or fabric, so you can select a standard or specialty fabric in any color at no added cost! How many tables do you have? Don’t forget to consider your head table and/or banquet tables as well as guest tables. Know your table shapes / sizes! You can’t rent a round linen for a square table. How far do you want linens to drop? You can have linens drape the floor, drape ¾ down, or drop to the seat level. Now it’s time for the exciting part – picking colors!